OUR 2018 RWFA 2ND ANNUAL GOLF OUTING WAS A BIG SUCCESS. THANK YOU ALL FOR YOUR SUPPORT. OUR 3RD ANNUAL OUTING WILL BE ON JUNE 28th, 2019. HOPE TO SEE YOU ALL THERE. AT THIS MONTHS BOARD OF EDUCATION MEETING HELD ON MAY 21st AT LINCOLN ROOSEVELT AUDITORIUM, THE B.O.E. ACKNOWLEDGED THE 2017-2018 HIGH SCHOOL WRESTLING TEAM FOR THEIR OUTSTANDING SEASON AND SECTIONAL CHAMPIONSHIP. For those continuing on.. GOOD LUCK IN ATLANTIC CITY.. DO WELL..
2/18/2017 - District 7 Tournament @ Ridgefield Park H.S. Three Roxbury wrestlers qualify for States. 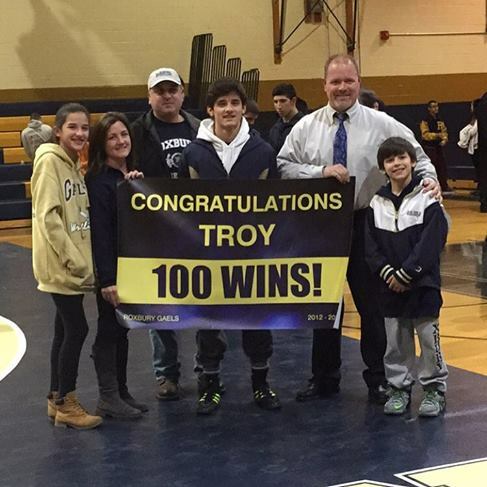 CONGRATULATIONS TROY STANICH 100 WINS!!!!!!!!! Congratulations to Roxbury's newest high school wrestling state champ, Dillon Artigliere! Dillon won the crown at 160lbs by going 4-0 over the weekend and capping a perfect 43-0 season. Stephen Caserta went 2-2 at 106lbs, making it to the round of 12, Jake Legotte went 2-2 at 132lbs and Stephen Arthur III went 1-2 at 195lbs. Well done, boys! Roxbury Pride! Four Roxbury Gaels will be heading to Atlantic City for the NJSIAA HS State Championships after a successful weekend in Sussex County. In addition to the District 2 Coach of the Year, Jim Dolan can now add Region 1 Coach of the Year to his accolades. Congrats Coach! See all the District 2 and Region 1 results here. The individual portion of wrestling season has begun and the Gaels had a very successful District tournament this year. 10 wrestlers placed in the top three to move on to the Region 1 Tournament next weekend. Roxbury won the District 2 title this year and Coach Jim Dolan was named Coach of the Year! The Jr Gaels continue to bring home the hardware! The Jr Gaels wrestlers came out as a team on a mission and for the first time in many years finished the tournament on top as CHAMPIONS!! A fine finish to a great season! 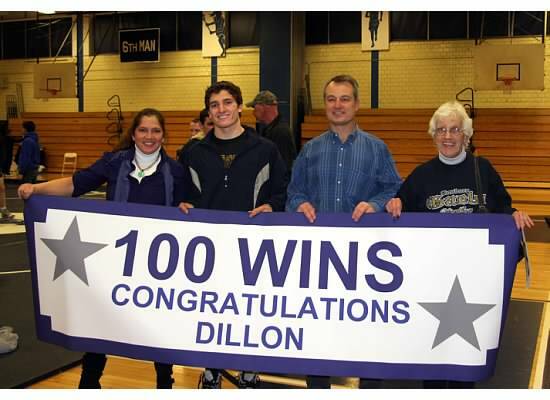 Congratulations to Dillon Artigliere on his 100th win!! Dillon accomplished this impressive feat as a Junior during Roxbury's recent 78-0 rout over Chatham. The past month has been a very typically busy January for wrestling. The RHS Gaels have now wrestled 18 matches with a record of 15 wins and 3 losses. The team started off the season on a roll with 11 straight wins against solid opponents. The three losses all came against teams ranked in the top 20 in the state. 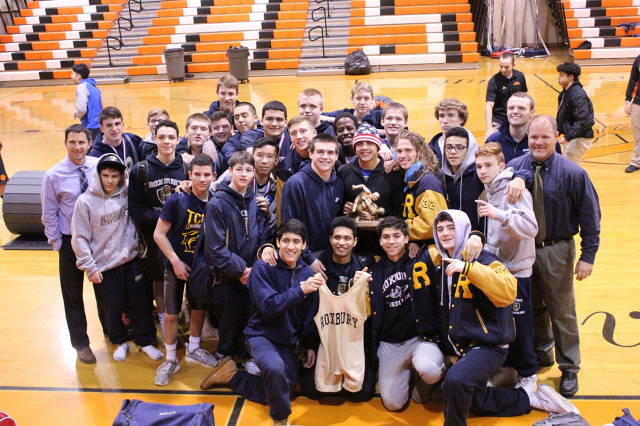 As a result Roxbury finished out the last week in January ranked #19 in New Jersey! In addition, the Gaels are also ranked 2nd in Morris County behind powerhouse Delbarton. Nice work, guys! Read about it here. The Gaels had a very good showing at the Morris County Tournament coming in third by a one point margin to West Morris Central. Dillon Artigliere became a two-time county champ and also took home the award for Most Outstanding Wrestler. Other placewinners include: Jake Legotte (2nd), Stephen Arthur (2nd), Stephen Caserta (3rd), Ryan O'Connor (3rd), Devon LaFranco (4th), Kevin Hernandez (4th), Jon Patane (4th) and Peter Sutton (4th). The JV wrestlers have been having an outstanding season as well. The boys took 1st as a team at the Morris County JV Tournament with Michael LaRusso getting an award for the quickest pins and Craig Roumes get the OW award. Five Gaels finished the season strong at the final JV tournament at Newton. Congrats to Tommy Manca, Justin Bacilo, Tanner Morgan, RJ Day and Aaron Sanchez on taking first in their respective weight classes! The Jr Gaels Tri County team has been having an outstanding season as well and are currently at 11-1 on the season so far with their only loss coming to a strong Phillipsburg team. All Jr Gaels turned out in force for Recognition Night at the RHS v Mendham match to see the Gaels send Mendham packing with a final score of 57-3. Both the Jr. Gaels and RHS wrestlers took on Randolph at the end of January in a matchup of the fiercest rivals in Morris County. 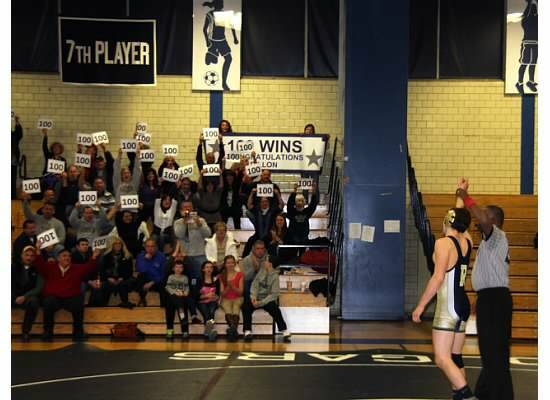 All Roxbury teams (including JV) won their respective matches. The matches were held in conjunction with another successful Rivals Takedown Hunger Food Drive. This was the 5th Annual drive. The RHS Interact Club sent volunteers to help collect and box up the food donations which were then taken to the Interfaith Food Pantry by the Gaels wrestlers. On a final note for the month, kudos to RHS Gael Dillon Artigliere on being named the High School Top Performer of the Week by the Star Ledger/NJ.com! Dillon, who placed 5th in the state last year, is currently ranked 2nd in the state at 160 lbs with a record of 28-0. Read more here. Congratulations to the Roxbury Gaels on their first place finish at the Dover Holiday Tournament on Saturday, December 15, 2012. The Gaels had 8 wrestlers in the finals with Stephen Caserta, Devon LaFranco, Kevin Hernandez, Jake Legotte, Jon Patane, Dillon Artigliere and Stephen Arthur taking home gold and Peter Sutton taking silver. Tanner Morgan and Stephen Satmaria took home bronze medals. 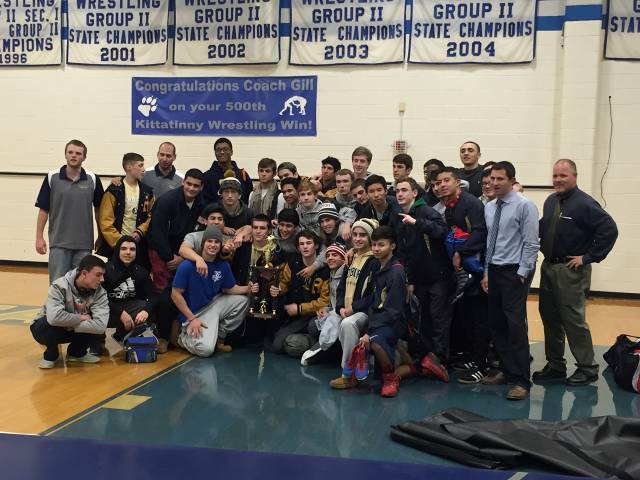 On Thursday, December 27th, the Gaels traveled to Sussex County for the Kittatinny Cougar Classic Tournament. 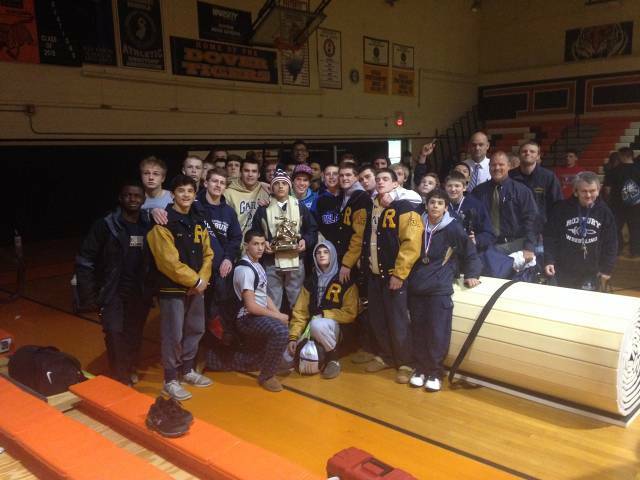 Overall, Roxbury placed second in the tournament behind a very strong showing of six Gaels in the finals. The JV wrestlers have been having much success as well taking home many gold medals at Dover, Kittatinny and our own JV Tournament at Roxbury. Check out the action at the Roxbury JV Tournament here. December has been a very busy month all around. In addition to a heavy practice, tournament and match schedule, the Gaels have made a couple of trips to Roxbury Social Services to help spread some holiday cheer. See the pictures here. The RHS wrestlers also run a clinic each year for kindergarteners and first graders looking for their first taste of grappling. Some of our high school boys started their wrestling careers in this same clinic. Some photos from the Friday clinic sessions can be found here. Other photos from recent matches and tournaments can be found on the Photos page. Check 'em out! The Roxbury Jr. Gaels Wrestling Banquet was held on Wednesday, March 28, 2012 at the Arlington. Great Job by all 2011-12 Jr. Gaels Wrestlers this year! Thank you to all the coaches who give so much of their time and energy. Best wishes to the 8th graders moving on to RHS. The results are in from all divisions. Roxbury came away from the 2 weekends with 4 placewinners! All wrestlers deserve a hearty congratulations for qualifying and competing with the best in the state. 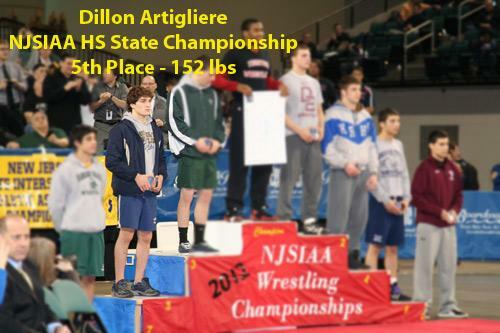 Congratulations to Dillon Artigliere on a 5th Place finish at the HS State Championships in Atlantic City this past weekend. An excellent showing was also seen from Tim Garripoli and Devon LaFranco. Three Roxbury Gaels will be making the trip to Atlantic City for the NJSIAA HS State Championships after a hard fought weekend in Sussex County. See all the Region 1 results here. The Gaels competed at all weights to take home a good deal of hardware including 4 District Titles after the weekend. All placewinners move on to the Region 1 Tournament next weekend. Roxbury placed second overall in the district. See all the District 2 results here.